Peas are well-suited to northern gardens, and fresh-from-the-garden peas are much tastier than their canned or frozen counterparts. Like corn, the sugars in peas quickly begin to convert to starches after they are harvested, so the sooner they are eaten after being picked, the better they taste. Begin planting pea seeds in the garden between mid-April and early May, when the soil is beginning to warm up. When planting very early, consider using "treated" seed, which is covered in a fungicide to prevent the seeds from rotting in cold, damp soil. The long, cool days of spring cause the plants to be more productive, and the plants themselves won't be damaged by any but the heaviest spring frosts. However, the flowers are not hardy and will be killed by freezing temperatures, so be sure to cover blooming plants if a frost is likely. Once the seeds are in the ground, they need to remain evenly moist for good germination, and careful attention should be paid to water needs again after blossoming for optimal production. Keeping the peas harvested will also lengthen the production period. Most varieties will benefit from some type of support, such as a trellis or netting, but dwarf varieties do not. 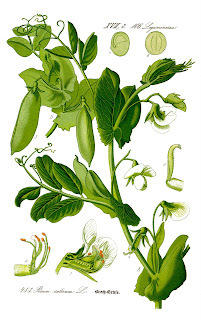 There are three types of peas: shelling peas, snow peas, and sugar snap peas. With shelling peas, the peas inside the pod are eaten, and with snow peas, the pods are eaten before the peas inside mature. Sugar snap peas can be eaten at any stage, pod and all. They do not need to be shelled, and the plants produce a higher volume of food than other types, so in my garden, they're the favourite!